When the dog attempts to lunge forward or attack, his jaws are closed by the slip ring. - Kind control - Stops pulling - Calms boisterous behaviour - Simplifies training - Corrects misbehaviours - Allows freedom to pant and yawn - On-off action to close biters jaws - Approved by vets and canine experts - Free 20 page training guide If you have a large powerful dog or one that pulls on the lead, you will know how exhausting walks can be. Dogs of all sizes can pull on the lead to the point of choking themselves. 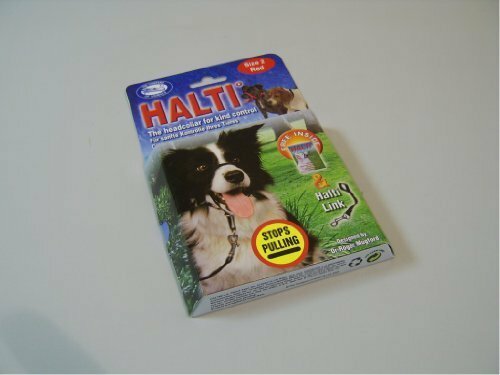 The Halti was designed by Dr Roger Mugford to come to the rescue of such dogs and their owners. Its revolutionary design is based on the same principle as a horse's headcollar - if you guide the head, the body will surely follow. Naturally following the contours of a dogs face and positioned well down the dog's nose, the Halti gives you maximum steering power and control. The particular advantage of the Halti is its unique on-off muzzle-closing effect: when the dog attempts to lunge forward or attack, his jaws are closed by the slip ring. When he is relaxed or friendly, he can pant easily and act just like a dog. The soft material and careful design and construction ensures the Halti is comfortable and in many dogs can create a pronounced calming effect.